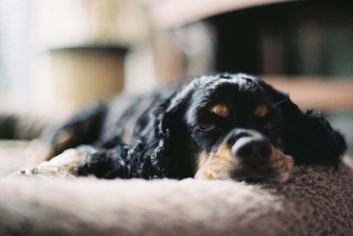 Intestinal worm infestation is a term that bothers almost each and every pet parent. Tapeworms, roundworms, hookworms, and whipworms are the common types of worms that can infest your pet. These parasites may seem harmless in the beginning but can lead to some fatal consequences in the later stages. Some of the symptoms of the infestations in your pet can be like vomiting, blood in feces, diarrhea, weakness, coughing, and a pot-bellied appearance. Just the list of these symptoms is enough to understand the importance of de-worming treatments. to save your pet from unnecessary sufferings. Therefore, like a doting parent, it’s your responsibility to start the treatment as soon as possible and save your loving pet from the possibilities of unnecessary sufferings. But always remember that not only starting a treatment is crucial but also choosing an appropriate product for the treatment is also very crucial. You have to choose the product which treats these parasites effectively. Droncit, Drontal Plus, and Revolution are one of the most popular brands out there in the market that prevents worms. 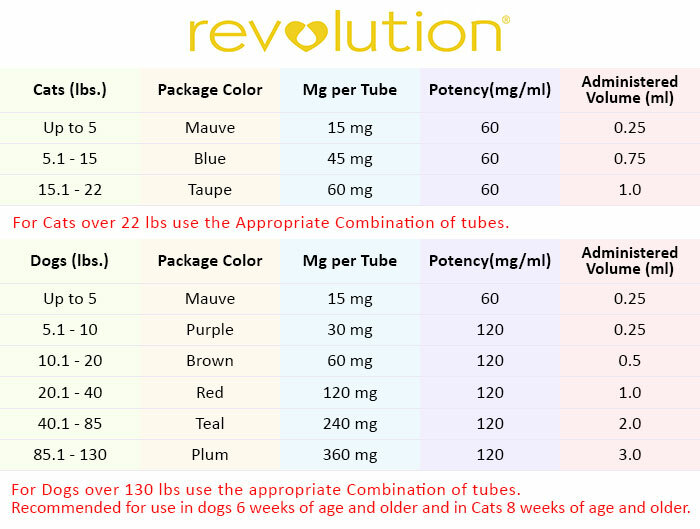 And to help you in choosing the most relevant Dewormer for your pet, below is the comparison of Droncit, Drontal Plus, and Revolution. Droncit is a specialized de-wormer exclusively for tapeworms. The De-wormer is popular because of it’s to the point treatment and efficacy in defeating tapeworm infestations. Let’s go through the characteristics of the de-wormer. Droncit contains Praziquantel as an active ingredient and it kills Hydatid tapeworm (Echinococcus granulosus), Zipper tapeworm (Spirometra erinacei), Dipylidium caninum and Taenia species within few hours of administration and 100% efficient in eradicating tapeworms. 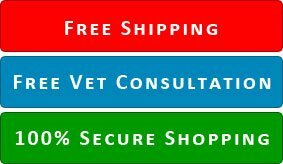 Type Of Treatment And Dosage– For dogs, the Tapewormer comes as a highly palatable chew and for cats, it is available both as a spot-on and as a tablet. 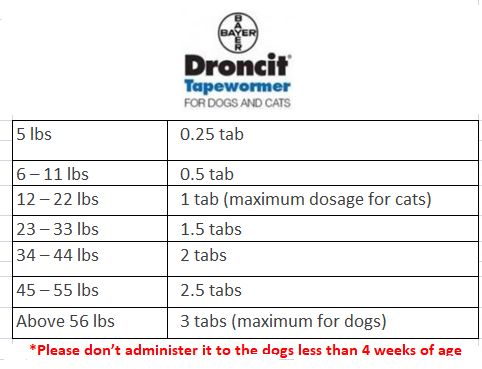 Droncit is an easy to administer product and below is the table to figure out the dosage quantity according to the weight of your pet. The de-wormer can be given every 3 months to keep your pet away from tapeworms. However, do consult your vet about the dosage intervals. In case of spot- on, the tube can be applied on a monthly basis on cats. Drontal Plus is a de-wormer that treats a wide range of worms like roundworms, hookworms, tapeworms, and whipworms thus providing a one-stop treatment in dogs. 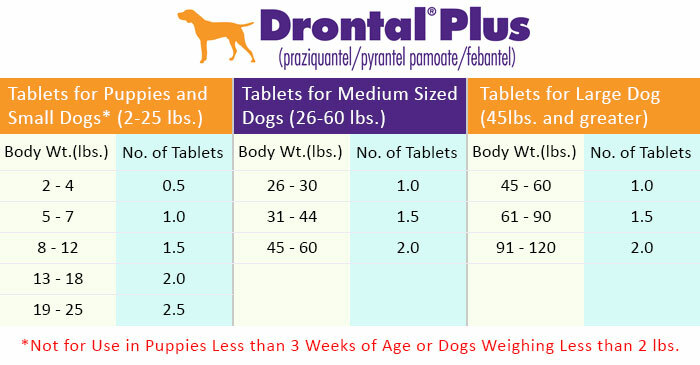 Praziquantel, pyrantel pamoate, and febantel are the prime and active ingredients of Drontal Plus. These ingredients treat and eliminate tapeworm infections caused by Dipylidium caninum, Taenia pisiformis, Echinococcus granulosus and Echinococcus multilocularis. Roundworm infections caused by Toxocara Canis and Toxascaris leonina, whipworm infections caused by Trichuris vulpis and hookworm infections caused by Ancylostoma caninum and Uncinaria stenocephala are also satisfactorily treated. Drontal Plus kills and controls worm infestations with full efficacy for 30 days. Being an oral treatment with a highly palatable beef-flavored taste Drontal plus makes the job of administering the treatment much easier. The tasty chew can be administered on a monthly basis to get the desired result. Revolution is an exception in this list because it prevents heartworms in dogs and cats and kills roundworms and hookworms only in cats. It is also a product that is popular amongst pet parents for the treatment of fleas and ticks. The heartworm preventive also prevents and treats ear mite (Otodectes cynotis) infestations and sarcoptic mange (Sarcoptes scabiei). Revolution contains selamectin as its active ingredient. Selamactin prevents heartworms caused by Dirofilaria immitis. It treats roundworm (Toxocara cati) and intestinal hookworm (Ancylostoma tubaeforme) infections in cats for a month. Revolution also eliminates 98% fleas within 36 hours and gives 100% protection from fleas when used consistently. Revolution is a topical treatment and comes as easy to apply spot-on. 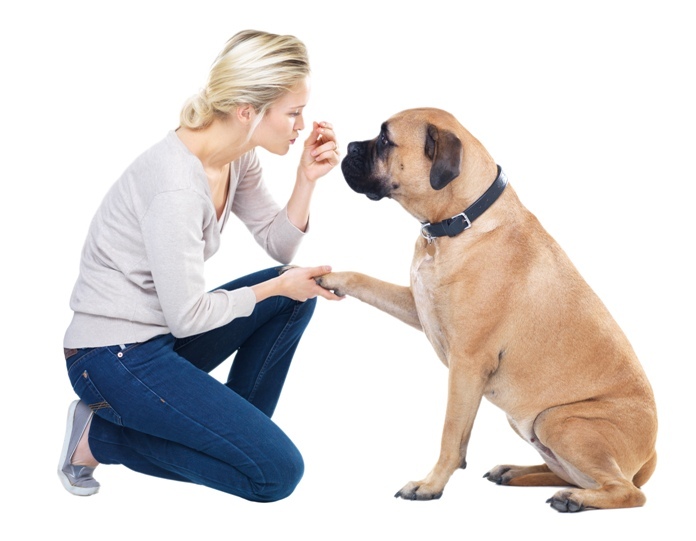 The de-wormer should be administered once a month to gain a parasite free life for your pet. Your love and concern are the only two things your pet thrives on. Just show the love and concern towards their health as well.